Greetings From Mr. Sound Off! Welcome to the unofficial tribute site of the Enormous 95 & the Equally Awesome 1580, Washington's legendary WPGC - AM & FM. These pages focus on the station's glory years as a TOP 40 blowtorch, covering the period from the late '50's through the early '80's. 18 years ago, this site was founded in tribute to Washington's longest lasting and most influencial Top 40 station ever. Beginning as souvenirs from a box in a garage, the site grew by leaps and bounds over the years due to contributions made by station alumni and long time listeners alike. Today at over 2,400 pages long, it averages approximately 10,000 hits per month and is still growing with over 200 airchecks and nearly 200 additional airchecks coming in the future. If you would like to make a contribution, please email the webmaster. Be sure to explore the greatly expanded history of WPGC, a far more detailed discussion of the various jingle packages used on the station through the years, a new section devoted to books that mention WPGC and the exact location of the WPGC-AM tower site, transmitter and studios when it first hit the airwaves on April 24th, 1954! Most audio files on this site are in the .wma file format (Windows Media Audio). To hear them, you must have a recent version of the Windows Media Player on your computer. Find specific recommendations for your Operating System and browser here. No, you may not copy audio or any other files on this site. All materials seen and heard on it are protected by U.S. Federal Copyright and Intellectual Property laws, are also protected by the Digital Mellennium Copyright Act and are subject to litigation should materials on this site be duplicated in violation of those protections! 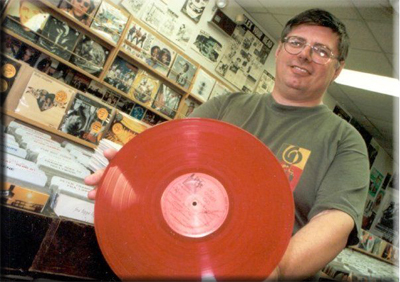 Skip Nelson at Yesterday & Today Records, Rockville. 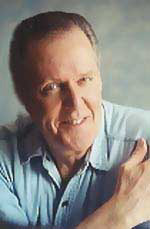 'Skip Nelson' hosted the WPGC Sunday Night Oldies show in 1981-82. He passed away on 02/18/19 at 70 after suffering a seizure. Read more. 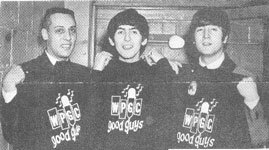 For the third week in a row, The Beatles hold all five of the Top Five positions on the WPGC Top Ten with 'I Want To Hold Your Hand', 'She Loves You', 'Please Please Me', 'All My Lovin'' and 'Till There Was You' in spots #1 - #5, as 'Twist And Shout' which moves from #9 to #7. To donate a playlist, please email the webmaster. Hear the WPGC Top Ten Line at LUdlow 1 - 1580 from 04/03/60! Original WPGC-AM Transmitter & Tower Site Found in Morningside! Using data collected from the FCC's Official Records at the National Archives in College Park, the exact latitudinal (38° 50' 29") and longitudinal (76° 53' 31") coordinates of the original WPGC transmitter and tower site from 1954-56 has been located with the use of GPS technology. 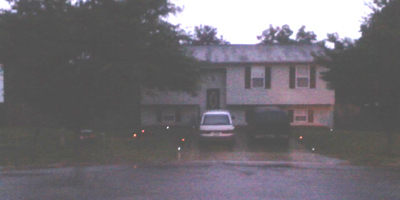 The lo-resolution photo above was taken with a cell phone at dusk in the rain. The exact spot is on the Morningside / District Heights border on Dottie Kelly Court off Anton St., off Walters Lane. Respecting the privacy of the residents, the actual street address is not given here. With the aid of a U.S. Geological Survey map from 1950, the paved and dirt roads leading to the site still exist (though all are now paved), directly in the heart of a residential development that sits on the farm once owned by Duval B. Evans, whom WPGC founder, Harry Hayman leased the land for the station. The site was abandoned in 1956. In order to raise power on the AM, a directional pattern necessitated erecting multiple towers. Ground conductivity beneath the site was poor due to sedimentation consisting primarily of rock. Whatsmore, access to the site (where the studio was also located) was particularly difficult in winter months on a muddy road. WPGC-AM was granted permission by the FCC to build its new three tower array on the property where WBUZ-FM's tower was located at 6369 Walker Mill Road while the AM studios moved to the space previously occupied by WBUZ-FM, above the Washington, Marlboro & Annapolis (WM&A) bus repair facility at 4421 Southern Ave. in Coral Hills, directly across the street from the District. Read an ad for WPGC-FM's predecessor, WBUZ-FM's sign-on. WPGC-AM just two weeks after it signed on in May, 1954. Hear Dr. McBlade's 20 minute montage of all the WPGC station mentions read by Casey Kasem on American Top 40 during the '70's (and a few from the '80's). Special thanks to Pete Battistini and Shannon Lynn for their assistance in assembling many of the excerpts contained in it. Now, on with the countdown! A very special Good Guy salute to Jack Maier who has tirelessly researched all the WPGC weekly playlist surveys that were published in the (Washington) Evening Star. Jack has copied every single list from the Arlington County library from the first week WPGC was included on October 5th, 1958 until the last on May 11th, 1974, a collection covering over 800 lists! 'Together Gold' album from 1970.
as he remembers his days at WPGC from 1966-68. See an advertisement of Milt Grant's early syndication efforts on WPGC and other Washington area stations from 1961. Turn on your blacklight, relax your mind and float downstream for a while with the Magic Carpet Ride, a short lived, super laid-back underground psychedelic trip from the Fall of 1968. Thanks to 'David' for 'weeding' this out of the smoke for us! Good Guy DJ Davy Jones reminisces about his days at WPGC from 1968-71 in an exclusive interview. The Parkway Building in Bladensburg has been torn down. Click on the image above to see before & after shots. Then click here to see more demolition photos. (Special thanks to Skip McCloskey for these shots). Read the history of WPGC - AM & FM through the years. Think you know your 'Dean Griffiths' from your 'Bob Raleighs'? Name the Good Guy DJ! Congratulations to Ron Evry who correctly identified the above as the late Dale Tucker who worked at WPGC briefly in 1964. (Special thanks to Bob Elliot for the photo above). Dale passed away in October, 2014. Ed Walker was one of the original WPGC Air Personalities , starting just two weeks after the AM signed on in 1954. He was gracious to grant us an interview in which he details his remembrances of the early days of the AM. Hear excerpts here. 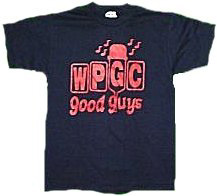 Fake WPGC Good Guys T-Shirt! Found on a Japanese site selling Beatles memorabilia, the artwork on this shirt was 'borrowed' from the legitimate sweatshirt John is seen wearing below from 1964! Can any other station claim such fame nearly 40 years after the fact?! 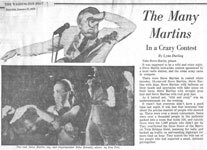 Learn the story and hear the saga as it actually aired on August 6th, 1962 when 'Barefoot' Larry Justice took matters into his own hands, locked himself in the control room and played the same song over and over again until management agreed to his demands for a raise. Special thanks to contributor Lee Whitney for the above audio. Hear Dr. McDigital's Super Groovy :30 medley of WPGC custom song mentions over the years. 'The New Sound of WPGC' from 1960 when it went 100% Rock & Roll! Saved from the garbage dump by Jonathon Wolfert, hear the only known copy in existence of the 'Washington, My Home' song created by PAMS for WPGC in 1962. Hear a Harv Moore promo cut in early 1963 while still in Kentucky touting his arrival in DC at WPGC! Hear a 1963 'coming to WPGC soon promo' from Bob Raleigh #1 (Rolle Ferrar) while still in Florida. PAMS Series 22 WPGC Instrumental Cuts from 1963. Special thanks to contributor Lee Whitney for the above. Read the saga of 'Famous Amos' and 'Handy Andy' when the FM went 24 hour in the Fall of 1968 here. Special thanks to contributor Rolf Rykken for the above. Listen to the Strikebound Sound of WPGC from May 1977. Special thanks to contributor Steve Willet for the above. Hear the WPGC Musicradio Montage featuring station jingles in context with the songs of the time from 1960 - 1982 originally produced by Tommy Edwards at WLS and also used on WABC's last day as a music station. Special thanks to contributor Tommy Edwards for the above. What a thrill to log on to this web site and see my air check and some background being published. These truly were the "good old days" in the 60's. We were teenagers and filled with excitement as we hit the air on WPGC-FM in its infancy. Read more. My most vivid memory has to be the strike. Truckers trying to run the Lincoln off the road while I was driving it, watching the picketers out of my apartment window, picking up non-union jocks at the airport...and yes I was on the air doing the Sunday morning news...it was AWFUL! Read more. I just happened to do a google search on my name and up popped the WPGC references...WOW...what a surprise. It was good to see faces of friends I haven't seen in more than 3-decades. I'm now an Anchor/Reporter for WOIO (CBS) and WUAB (UPN) / Cleveland. More info can be found about me by going to 19 Actionnews.com. Read more. I worked for WPGC from 1962 to 1975....during all of the good times. I was 21 when I went to work there. It was my most "fun" job ever. I started working there part time in 1962...I had 3 small babies and was just getting back to work. Quickly, Bob Howard realized I had more potential and I became his secretary. To sum it up, we had a lot of fun and were very close. I really missed it at first when I left, but I knew it would never be the same. We were #1.....and that was the best time of "Rock and Roll". Read more. What a great website...the "blowtorch" line alone makes you feel proud to have been a part of it...you know for years I never thought much about WPGC then I saw the Cameron Crowe film, Almost Famous... I'm sure the other guys from the' 72 to' '75 years had similar feelings...in many ways we were like the band on the bus rolling through the heartland, just headed somewhere with our music ... and dreams of things not as they were but as we longed for them to be...it was a pretty special time... Read more. 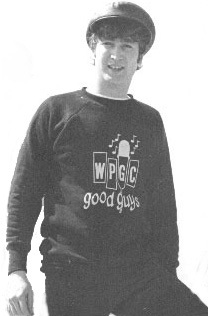 I just stumbled across the WPGC tribute website and found myself from 1973! Great looking website. It brings back many memories. Read more. I totally enjoyed my time at WPGC and wish to hell that I were still there. I was fortunate in that I started working there during the summer of my sophomore/junior year in high school. I was a news editor by day and jock wannabe by night. Alexander Goodfellow helped me with my first production room aircheck which really sucked. Others like Joel Denver (Jim Madison) would let me run the board out of stopsets. Talk about taking a chance! Read more. I started working at WPGC in 1976. I smile every time I think about those days. The staff was as close as family members. I am still in contact with some of them today. My office in Bladensburg was right behind the receptionist, the late Phyliss Gammon and next to Music Director, Jim Elliott. My office in Greenbelt was a little isolated from the other offices and we all still found a way to stay close. I moved to the sales department in 1980 or 1981. Read more. In 1959, we put a "Good Guys" Top 40 format together at a little station in York, PA owned by Susquehanna Broadcasting. The company purchased a station in Ohio (Akron to be exact) and in 1961 they named me as their first program director at WHLO and of course, the "Good Guys" format trailed along with us. 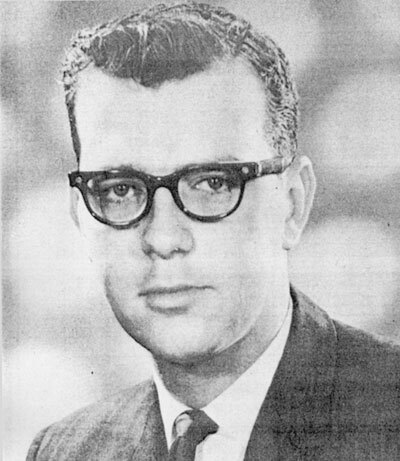 By 1966, the station came to the attention of Bob Howard, the GM of WPGC, whose family lived in Cleveland. He would monitor the station when he visited his relatives, and about 1966 he and I got in touch and next thing you know, I was living in Silver Spring, MD and I was the afternoon jock and the PD of WPGC. Read more. I occasionally take some time and go to this site and sooooo many memories come flooding back. Many people don't appreciate what they've got in living day to day...whether it be a great soul mate or a great radio station. WPGC was a GREAT station and so far ahead of its time in that we were one of the first successful FM stations (due to the heavy penetration of FM in DC). WPGC was part of people's lives...they came to us to be with friends , to hear new music, to be entertained and to win great prizes (and a lot of cash)....and the loyalty of the listener was reciprocated by on air personalities that really cared about the station, the community and each other. Read more. I started at WPGC when the station went 24 hours on FM in the Fall of 1968. Bob Howards bizarre marketing idea to promote WPGC going all-night on FM was The return of Amos and Andy to radio, thus the Famous Amos and Handy Andy monikers. The actual, cost-savings reason, of course, for having two part-time people on overnight was you didn't have to pay full-time AFTRA wages. Read More. I am truly stunned at all the stuff you have on what will always be my favorite station. Really, it's quite an achievement and as an official former Good Guy, I am very grateful. I was especially impressed with your stuff on Jim Collins, and was touched to see the dedication to him. Read more. My greatest experience was meeting Ted Davita. Ted was a young boy at NIH with a rare blood disease. He became one of my best friends. I visited him every week and he called me every night. His father was Director of the Cancer Institute. Do you remember the TV movie "Boy In A Plastic Bubble"? Most of that story was based on Ted including going to concerts at the Cap Centre in my van and him wearing his NASA designed space suit. He died at the age of 17. Read more. What can one say, being part of a legend is totally nuts. Deep in my heart I truly believe there will never be a time in the industry where so much was put into the presentation of a radio station, as was put together by the great staff of WPGC. I'm extremely proud to have been apart of the best moments of radio that ever existed. Read more. Bob Howard tried to change my real name...Lawrence Kirk Justice...to some stupid off the wall stage name ....we compromised and settled on Larry Justice...however he insisted on 'Barefoot' Larry Justice, friend of all the 'Barefoot' housewives. How do you think that would have played in 1968 when they were burning their bras? I was never crazy about "Barefoot." During the 'take over / lock in', a major mob of fans gathered outside the station on Southern Ave. and the PG County police had to be called to control the crowd. Wow! What a hoot. Bob was threatened for taking advantage of a country boy! Read more. I was the first female who was on the air before midnight (at age 23) and even filled in for Don Geronimo (6-10pm) when he was on vacation. The General Manager didn't care for this "girl" on the air, but Steve Kingston was very supportive until he left. Read more. A couple of things I remember most about the Black Ulysses overnight remote: Harv Moore didn't want to do it. It was good money in an unrated slot and guess who won? Bill Prettyman. I got a nice talent fee on top of my $4.72/hour. The restaurant provided an all-night cafeteria-style breakfast that was first class after all the clubs closed at 2AM...including the Ulysses which had show bands like "Octagon" and "And The Professionals". Read More. At the request of John Gehron (then WLS PD, my college PD, and now GM of Clear Channel Chicago) I taped Columbus without his knowledge. John used the tape to get him to Chicago as his production director. A year later, he resigned, saying that the production work was getting in the way of his free lance business, which was (and from what I hear is) quite successful. Read More. I began there in 1978 in Bladensburg as the Accounts Receivable Clerk and worked in that little tiny room in the back with Chris Fisher and Sheila Chandler. Chris was always telling us stories about Elvis as she was such a fan of his and Sheila made me laugh 8 hours a day. Chris must have wondered about us because we were always giggling. Read more. As a native, I started listening to WPGC as a kid. So my interest in the station is much more that just working there. Just for the record, I started at the "PIG" as a engineer at the transmitter site in 1970. I am a fountain of "useless" knowledge of the station from '70-74 as an employee, and as a fan prior to that. Read more. I was hired in the summer of 1971 after I heard an announcement on Harv Moore's show that the station was looking for a receptionist and general office person. I called the station and got an interview with Dee Masano a few days later. I had worked briefly for KVI radio in Seattle before moving to DC in 1970 so I knew the phones and bookkeeping stuff but I had stayed at home for a while and wasn't sure if Bob Howard would give me the position. Read more. Bob Howard had a "right of first refusal" on the sale of WPGC. When the Richmonds tried to sell it to the Marriotts, he exercised it. Got a bundle. He used the money to buy WYSL and WPHD here in Buffalo in Oct '74. He asked me to moved up here and work for him. I left WPGC in 1975. I had worked for him since 1963, so we had a good working relationship. Read more. As far as working there as many times as I did, I can think of a few folks who stopped by twice (Jim Collins, Dino Del Gallo, Linda Kelly immediately come to mind) but never a third. QUICK! CALL GUINNESS, AND TELL 'EM TO STOP THE PRESSES. WE HAVE A NEW WORLD'S RECORD! Read more. OK, so here I am a 65 year old former disk jockey with nothing to do one evening, so I Google myself and what do I find? I find that I was at one time semi famous in DC. Actually I really got a kick out of remembering some WPGC times, people and, of course, music from the late 60's. Read more. Great website. It mustta took lotza work to put together and it looks great. I'm in San Diego and President of my own advertising agency, AdVIZOR. It's a start-up but going pretty good. Read more. What a great website. How great to see and hear about the guys I worked with from '68 to '70 at the PIG. But talking about being out of it...I had no idea about Jim Collins. He was a great guy. Really sorry to hear that news. I'm semi retired in Punta Gorda Florida, doing a three hour morning gig at WCVU 104.9 FM and was thrilled to find this web page. Great Job. I put it on my favorites. Read more. Great web site. Been looking at the site for an hour...WOW. Thanks for the hard work. I'm now Mike O'Brien at STAR 102 Kansas City. Been in KC since 1973, after leaving WPGC and WYRE. Read more. I enjoyed cruising around the WPGC website a great deal. Spent some time there in '70-'71. Hired by big Wilson and worked with Harv Moore, several Bob Raleighs and my best buddy there at the time was Davy Jones. I was, mostly, a News Guy. Keep up the good work. Came across your website almost by accident while reading about the sad passing of Dean Griffith. Great site that brings back lots of fond memories. Went to the "News Guys" page to check on some old friends, and lo-and-behold - -found my name from my brief stint at 'PGC. While there, I was "Wally Weaver", a name concocted by then 'PGC PD Scott Shannon. I continued to perform news duties at Z-104 in Frederick under my real name, Wally Hindes. Read more. Best comment of the week wins $30 (not really!). Send yours to the webmaster. 15 years ago, this site was founded in tribute to Washington's longest lasting and most influencial Top 40 station ever. Beginning as souvenirs from a box in a garage, the site grew by leaps and bounds over the years due to contributions made by station alumni and long time listeners alike. Today at over 2,000 pages long, it averages approximately 10,000 hits per month and is still growing with over 200 airchecks and nearly 200 additional airchecks coming in the future. If you would like to make a contribution, please email the webmaster. To donate an aircheck, please email the webmaster. Approximately 150 feet diagonally behind the house are rusty metal spikes in the ground that were used to support the original 150 foot tower's guy wires.